"Winnipeg-raised singer/actor Thom Allison is pure dynamite as jazz pianist Coalhouse Walker." "Fortunately the center of the show is Thom Allison as Coalhouse Walker, in the role that made Brian Stokes Mitchell a Broadway star, and he has both the outsize personality to helm it and the voice to support it. His warm, bluesy vocals bring out the best in the Flaherty-Ahrens songs." "Thom Allison’s Coalhouse Walker is a very compelling man of inherent style, the most dynamic of the three anchors in the show, who sings full-bodied in all registers with resonance of deep beauty. I thought of Leon Bibb’s similar tones and when Allison sang I certainly wanted to listen, I wanted more." "At the play’s emotional center, though, (is) the prideful, ambitious Coalhouse, majestically performed by Thom Allison." "Alana Hibbert’s Sarah and Thom Allison’s Coalhouse are superior to their Broadway predecessors, with Allison proving that if Canadian musical theatre could cultivate stars, he would be one of the first magnitude. Sexily dapper, with a warm, robust baritone voice, Allison is the magnet that draws all eyes to his charismatic performance. He acts with great dignity and romantic charm, but when he rages over the gross injustice he has to bear, he is a fierce avenger rather than a mere fanatic." "Thom Allison brings joy and tragic dignity to Coalhouse Walker Jr., a black musician who aspires beyond his time..."
"The obvious star role, though, is Coalhouse. Thom Allison has been a star in my book for years, illuminating his roles with a Satanic gleam that he moderates in the first half of this show to a charismatic glow, augmented by his ringing singing... he’s just as powerful in the second half..."
"Coalhouse, as played by Thom Allison, is the kind of star performance one has come to expect from this gifted performer. Over the years, Allison has proven to be an actor capable of exploring every aspect of the character he is portraying and building a completely organic performance. His passion comes through even more apparently when singing. When he raises his voice in the climatic “Make Them Hear You” the result is one of many spine-tingling moments in this production." "Thom Allison is an elegant Coalhouse Walker Jr., stopping the show cold with Make Them Hear You and everything else he sings." "Coalhouse is played with immense dignity and captivating flair by Thom Allison, who by sheer force of will becomes the center of the show in his thrilling projection of the song “Wheels of a Dream,” in which he foresees a bright future for himself, Sarah and their son." "There’s a moment in the first act of Ragtime, which opened Saturday night at the Shaw Festival, that is guaranteed to send chills down your spine, fill your eyes with tears and make you rejoice at the power of theatre to move us. Thom Allison, as Coalhouse Walker, the ragtime pianist with big hopes for the future, is singing of the world he envisions for his woman and their infant son in the exquisite song, “Wheels of a Dream.” As he sings the words, “Beyond that road, beyond this lifetime,” eyes shining, voice swelling, he flings out his arm towards the vision he sees ahead and in that split second, Allison becomes the great new leading man of Canadian musical theatre. Allison is the heart and soul of this production of Ragtime. His passion and commitment drive the work whenever he’s on stage." "The heart and soul of the show, however, belongs to a successful African-American ragtime pianist Coalhouse Walker Jr. (Thom Allison) . . . . . . .Allison, making a triumphant return from New York where he’d been in Priscilla: Queen of the Desert, paints a strong, proud portrait of Coalhouse; his inherent likeability makes the character’s dark turn into vigilantism terribly seductive. What thrills, however, is his smooth, rich voice – a tenor that sounds like a baritone – turned to some of Flaherty’s best anthems, such as Wheels of A Dream." "But while it is the entire company that carries this production aloft, it truly soars on the wings of a few individual performances, capped by Allison’s carefully crafted, powerful turn." "It is also a Shaw lovefest for star Thom Allison, who was persuaded to leave the Broadway run of Priscilla early for this show. He got the longest, most vocal standing ovation I’ve seen in 22 years at the Festival Theatre, and every second was earned. It’s a performance the Shaw should market far and wide." "There's a moment in this production, a moment of joy before the chaos, when Coalhouse Walker, the black ragtime musician soon to be transformed into an avenging revolutionary, unites with Sarah, the woman he has come to love, for a soaring rendition of Wheels of a Dream. In performing this beautiful and eloquent song, Thom Allison and Alana Hibbert triggered a thundering ovation from an opening-night Festival Theatre audience, and with good reason. . . . Thom Allison's knock-out work as Coalhouse Walker makes an indelible impact." "Thom Allison’s performance as Coalhouse is impeccable." "It is the joy and dignity of Thom Allison’s portrayal that make us care so much about him, and which render his grim fate the more tragic." "Allison nails the role of Coalhouse Walker, the charismatic jazz pianist, and he is worth the price of admission alone." "Thom Allison’s Coalhouse Walker is the deep and thrilling center of the show." Song and Script Exclusive: Thom Allison, Winnipeg-born Star of Broadway’s Priscilla, Queen of the Desert set to explode as Coalhouse Walker, Jr. in Shaw Festival’s Ragtime! It’s rare in musical theatre when you see a performer exude charisma and absolutely shoot sparks out of every pore. Raul Esparza did it last summer singing and dancing in North York at the Black Creek Summer Music Festival. He did it before that in the 2006 Broadway revival of Stephen Sondheim’s Company. Winnipeg-born Thom Allison does it all the time. For the past seven weeks (since April 10th), capacity audiences attending the Ahrens/Flaherty musical Ragtime at the Shaw Festival have greeted the talented cast’s performance with instantaneous, enthusiastic standing ovations. However, they save their loudest cheers when the dramatically handsome Thom Allison steps forward. They are hailing a bona-fide star who just happens to be a Canadian. The buzz on Ragtime is hot. And as they say, the best way to sell a show is word of mouth. No ads or marketing campaigns can beat it. Allison is even more powerful in concert. When he takes to the stage he bursts with joy, power and passion. On Christmas Eve 2010, he took a break from co-starring in the Broadway-bound production of Priscilla, Queen of the Desert to sing the finale of Metropolitan Community Church of Toronto’s (MCCT’s) annual Christmas Eve concert. With the church’s renowned and multi-talented choir, under the direction of Toronto musical theatre maven, Diane Leah, Allison enthusiastically embraced a newly arranged medley of two beloved songs: John Lennon’s “Imagine” that segued into Leonard Cohen’s “Hallelujah.” Accompanied by the choir and a jazz ensemble, he totally rocked the place! After the final note faded, the capacity audience/congregation leapt to its feet in thunderous applause, something, I’m sure you will agree, doesn’t usually happen on Christmas Eve. Cyberworld was alive throughout the next week with people e-mailing, twittering and face-booking their family and friends, enthusing about what they had just experienced. And it happened again on May 14th, just a week ago this past Monday, during the annual Toronto United Church Council’s (TUCC) annual Heart & Vision Awards Ceremony. TUCC presented a formidable cast of some of the best of Canadian musical talent including renowned opera tenor Richard Margison and the legendary Jackie Richardson among others. Where he gets his energy know one knows, as he then, with the MCCT Toronto choir, kicked into a rousing rendition of “I Know Where I’ve Been” from the musical Hairspray. Before Thursday’s Ragtime matinee this week, he took a break to chat with Song & Script. Dressed to beat the heat in a pair of shorts and a golf shirt, Allison said he first heard about Ragtime early on in the mid-1990s while Livent was developing the musical in workshops and he was playing the Acid Queen’s pimp in the Canadian production of The Who’s Tommy, directed by Des McAnuff. He was intrigued because few new musicals were developed so meticulously in so many series of continued workshop. This was a new method of development for the industry. Allison saw the fourth workshop and then the finished version in Toronto early in the run. “It was spectacular,” he gushed, with his eyes as wide as a child’s on Christmas morning. Then, 16 years later, his agent received a call from Shaw Festival artistic director Jackie Maxwell, asking if he might be interested in playing Coalhouse at the Shaw Festival. Three days later, she called to say “It’s yours.” Allison had landed one of the greatest roles in musical theatre (let alone literature) history without an audition. If comments from audience members are any indication, Allison has succeeded in making Coalhouse a believable, sympathetic and credible character. “People ask me all the time about Coalhouse, assuming he had really lived, that he was a real person,” Allison says with his perpetual smile, as he shakes his head. Later this summer, on June 10th, Allison begins previews as Diamond Louie in His Girl Friday, American playwright John Guare’s stage adaptation of the newsroom classic play The Front Page and the movie version His Girl Friday. Opening night is Saturday, July 7th. Thom Allison’s album “A Whole Lotta Sunlight” is available [here]. Musical director/pianist is Diane Leah who also produced the album. Executive producer is Thom Allison. 14. What Are You Doing New Year’s Eve? In 1996, Garth Drabinsky’s Ragtime jumped onto the stage at the Ford Centre for the Performing Arts in a lavish production that stirred hopes of Broadway dominance. No expense was spared in the $11 million show, with 58 actors, 28 musicians, a real Model T car, numerous gorgeous sets, and an original book and score. Sixteen years later, it returns to Canadian soil in the Shaw Festival’s summer season, which officially opens this week after weeks of previews. It’s a pared-down version with a cast of 30, 18 musicians and one spare set that frames the stage with stairs and a catwalk. But the songs are all there and so is the Model T (a prop this time, not a real car). In the intervening years, Ragtime played on Broadway for two years and there were numerous remounts in the U.S. and England. But it never struck that magic chord with audiences — lured by competing extravaganzas and hummable tunes — that Drabinsky yearned for when he commissioned playwright Terrence McNally to turn E.L. Doctorow’s book into a play in the early ’90s. Its themes of racial intolerance, social injustice, poverty of newcomers and the yawning gap between rich and poor have greater resonance today than ever before, says Jackie Maxwell, the artistic director of Shaw, who is directing Ragtime. She was a “Ragtime virgin” when she selected the show for this season, never catching up with it in its various incarnations, but the idea of bringing it home to Canada has been percolating in the back of her brain for the past few years. 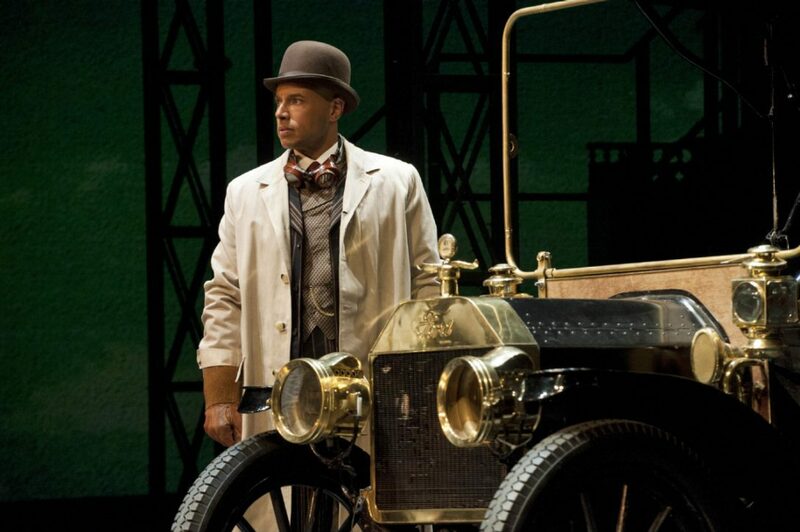 The discrimination faced by black pianist Coalhouse Walker Jr. — his beloved Model T Ford is destroyed by rednecks and the police won’t help him — is the central action of the play. It also has parallel stories of an oblivious, well-off, white family and struggling, exploited immigrants. This smaller Ragtime in the 856-seat Festival Theatre stars Thom Allison, Patty Jamieson and Jay Turvey in a production that has attracted sellout crowds (eight of 23 shows) and standing ovations during previews. More than 44,000 tickets have been sold for the show so far, on a par with last year’s successful My Fair Lady. “The audiences have been sizeable,” says Maxwell, which augers well for the success of the show this season. Those audiences gasp when they hear racial epithets, she says, and she can tell those who haven’t seen the play before or read the book. Those people call out or clap with glee when they see real-life characters in the play from contortionist Harry Houdini to anarchist Emma Goldman and business magnate J.P. Morgan. Allison, who plays Coalhouse Walker Jr., says he’s had a hard time convincing people that his character is fictional because of the clever use of era-appropriate celebrities such as black leader Booker T. Washington in the play. Ragtime has never been a walk in the park. Those involved with the 1996 Toronto production remember it as a time when no expense was spared and everyone felt part of a significant event in entertainment. Although Ragtime lasted two years and won Tony Awards for Best Book and Best Music it has not received the credit those involved thought it deserved. Ragtime was eclipsed by a juggernaut that had already landed on Broadway: The Lion King, whose puppetry and exotic African elements made it a hit that continues to draw audiences today. Rent was also already established as a hit when Ragtime arrived on Broadway following a lengthy polishing in California. Those over-the-top spectacles just aren’t practical anymore, says Peter Lamb, who was production manager and senior technical director for Livent and now works with Dancap Productions. This bodes well for Shaw’s intimate Ragtime, which Lamb thinks resonate more strongly with today’s audiences. Whatever the size of the show, the characters are strong and compelling. David Mucci, who had the role of the fireman Willie Conklin in both the Toronto and Broadway productions, says playing the racist who sets the tragic story in motion was one of the most difficult roles of his career. Mucci slunk out the theatre’s side door nightly to avoid the crowds. Actor Ron Bohmer had another difficult role in Father when the play was produced at the Kennedy Center for the Performing Arts in Washington, D.C. before another short stint on Broadway. Father is the white, self-made man going on expeditions and enjoying his status, unaware of the sweeping changes around him. “The challenge was to not make him a villain,” says Bohmer, adding that he focused on Father’s dedication to solving problems, even the one facing Coalhouse at the end. Alana Hibbert, who is Coalhouse’s girlfriend Sarah in the Shaw production, refuses to play the single mother and house servant as a victim. She was “ecstatic” when she landed the role. .
“It’s a grand piece of musical theatre,” says Hibbert. Shaw is betting on it. On the doorstep of the U.S. bicentennial in 1975, E.L. Doctorow wrote a novel about the American experience at the turn of the 20th century. It wove together loose narratives, some fictional and some historical, on the era’s converging cultures, the melding of religious, socioeconomic and cultural mores. Three prominent ethnic groups — African-Americans in Harlem, WASPs in New Rochelle and Jewish immigrants on the Lower East Side — challenged one another’s sensibilities, bent traditions and defined a new way of coexisting in the same city and under the same national flag. “Ragtime,” the centerpiece of the Shaw Festival’s 51st season, was musical before it became a musical. Doctorow’s language was lyrical, dancing about the page like a player piano. His characters were driven off course, syncopated like the popular musical style of the day. There was rhythm in his New America, even if it sometimes missed a beat. When Shaw Festival’s artistic director Jackie Maxwell first read Doctorow’s book years ago, she was moved. This democratic outlook fuels much of Maxwell’s production at Shaw, which is itself a dialogue in cross-national perspectives. The layers here are harmonic, and not at all lost on Maxwell. The plot is full of ragged character sketches and incomplete storylines. It is like a moving postcard, a diorama of both a singular moment in American history and a sweeping brushstroke of an era’s epic shifting tide. There are no fewer than a dozen important characters, most of whom are fictional, even generic. Central characters Sarah and Coalhouse, two African-Americans spinning on the wheels of their American dream, are wrapped up with the buttoned-up Mother and Father, nameless heads of a conservative well-to-do family. Some attitudes within this foursome evolve, while others remain tethered to the past. Historical figures like escapist Harry Houdini, carmaker Henry Ford and murderess Evelyn Nesbit come into view, too, interpolating with fictional characters and winking to the audience with foreshadowing commentary. The birth of that other American dream — celebrity, fame and notoriety — had begun. Facets of modern life were changing, but not always in tandem, and not always for the better. Actor Thom Allison, who plays the hopeful but embittered Coalhouse Walker, notes the emotions that plague these characters’ transformations. Like Maxwell, his Canadian perspective informs his American character. “It’s interesting, the good and bad versions of aggression that we talk about Canadians and Americans lacking or having. Americans have an aggressive personality, which is actually not a bad thing. The assertiveness of standing up for what you want and what you need. Canadians lack that assertiveness, [but] the good side of that on our end is a politeness,” says Allison, ever gracious so as to not offend. There are many commonalities between the two cultures, he adds. A shared belief system. “With a show like this, we get the story of it. We understand wanting something so much,” Allison continues. “I think for us, it’s the exploration of the human level. People who want so much to be a part of something bigger. To belong. To be accepted. To be respected. So certainly, as Canadians we have that desire. The timing of this production is hardly surprising to followers of the Shaw Festival, which includes in its mission plays by George Bernard Shaw and his contemporaries, contemporary plays depicting Shaw’s era, and works that speak more broadly of the modern American narrative. The 2009 Broadway revival of the acclaimed Kennedy Center production connected obvious dots to the 2008 election of President Obama. Much has changed, in just the last 16 years. With a new century, a new hope. With a pioneering leader, a new acceptance. The turnstile of one century is the same as the next.